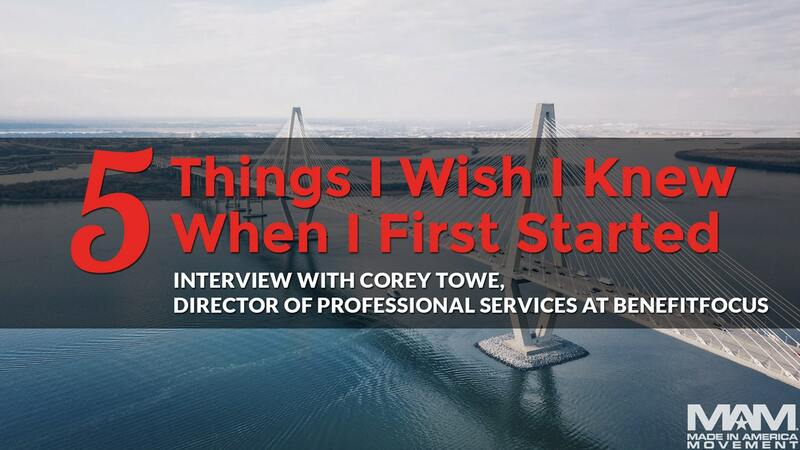 I had the pleasure of interviewing Corey Towe, Director of Professional Services at Benefitfocus. 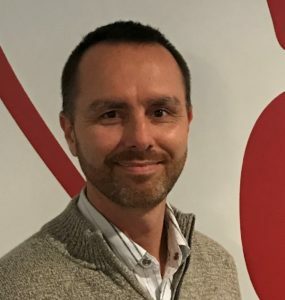 Corey is responsible for all new customer implementations and the delivery of multi-million dollar portfolios for the Charleston, SC based Healthcare tech company. Corey has a proven track record of building high-growth tech companies, while also passionately creating healthier companies from the ground up. My backstory follows a somewhat non-traditional path. I spent the first (6) years out of college working for a non-profit organization. The organization was highly focused on pioneering, entrepreneurship and leadership development. It was there that I really laid the foundation for how to approach starting things, how to lead people and organizations and pressure tested my value system. The things I learned in my non-profit experience helped shape my approach as I’ve moved into the for-profit world starting and building teams and businesses. 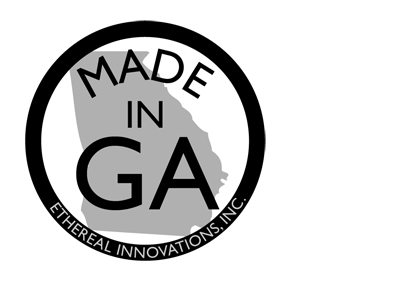 After (6) years in the nonprofit world, I joined an early-stage tech startup in Atlanta. We built products/services for the then recently deregulated energy industry and I was able to wear many hats while growing the company. Due to the startup nature, I was able to do everything from running projects to running our own mergers & acquisitions to fuel growth to running our overall technology solutions office responsible for driving product innovation. It was here that my passion to innovate and build things was expanded and validated as I was exposed to many different aspects of running a high-growth business. Over my (7) years at the company, we grew from nothing to $80+ annual review that ultimately led to being acquired by another US based company. At this point I was itching to start my own technology company. I ventured out on my own and started a tech company called Hands On Test. Hands On Test provided a tech product that helped companies maximize their time finding software engineering talent. We built a product that helped companies validate software coding skills during the interview process using cloud-based technologies. Although ultimately not successful, I learned invaluable lessons about starting and growing businesses with a lean approach, how to work within the dynamics of the startup investments markets and ultimately how to deal with failure. It was a great building experience that has parlayed into continuing to build exceptional products and teams wherever I’ve gone. Since then, I moved to Charleston, SC and joined another high-growth tech company, Benefitfocus, where I get to continue to drive innovation and build high-performing teams and organizations. Benefitfocus provides a leading cloud-based benefits management platform that simplifies how organizations and individuals shop for, enroll in, manage and exchange benefits. Every day I get to come in and contribute towards building a healthier organization and leverage my passions as an entrepreneur and leader. I get to invest time in unlocking the untapped potential in those around me and inspire them to go further faster while living from their purpose. My purpose motivates me. The challenge to find ways to unlock the untapped potential in those around me and enable them to go places they could never make on their own. Seeing potential in people unlocked is a great motivator and keeps me going. I believe that people are the ultimate activators of progress and leading people is the ultimate motivator. I also love to build things – building organization, build teams, build people – and solve problems that add measurable value for the people around me. I’m a highly ambitious person who loves to take on challenges and drive value-added solutions. I think this is best summed up by a quote from the pastor of the church I went to in Atlanta, Andy Stanley from North Point Community Church. He always said, “Leadership is a stewardship. It’s temporary and we’re accountable.” To me, that describes my general approach to leadership. I believe I am ultimately a steward who is responsible to maximize the value created from my time leading any part of an organization. This comes from serving, putting people first, being humble, creating an environment where the best idea wins and leaving what I touch healthier for the person who will lead after me. At the end of the day, leadership is about leading humans and I want to inspire those within my influence to go further than they ever thought possible. That, to me, is leadership. How do you balance between the pressure for short-term growth and the need for building long-term momentum? This is a great question. I view this not as a problem to solve but as a tension to balance. I’ve worked for both privately and publicly held companies and experienced the tension between short and long-term focuses. Several years ago I heard Simon Sinek use the term “long-term greedy” that I adopted. The target is to be long-term greedy, which means short-term decisions are made with the long-term in mind. I think this tension is balanced through transparency, clarity, humanizing decisions and minimizing abstraction as a leader. As leaders of organizations, the #1 thing our people need from us is clarity. They need clarity of vision, values, roles, responsibilities, acceptable behaviors, culture norms, the “why” behind decisions being made and the long-term intention of these decisions. It’s easy for leaders in growing companies to become abstracted from the humans impacted by decisions being made. We can start to pay more attention to spreadsheets vs. understanding the front-line and long-term impacts of our decisions. It truly is a tension to balance. We have to lead people and not lead the numbers. There are short-term pressures that are real. We work in competitive markets and often need short-term growth to survive, but, at the end of the day, we want to build long-term, sustainable enterprises that add value to our employees and those markets we serve. I’m grateful for Brian Porter. I met Brian while I was a freshman in college at Georgia Southern University. He invested in my relationally, helped a kid from North Georgia who didn’t know anyone and, in turn, helped influence the trajectory of my life. Several years later, Brian took a chance on me when I was leaving the nonprofit world and trying to find a job. Our first child was (3) months old at that time and we were moving back to Atlanta for the job search. Brian had just started a tech company in Atlanta and was working to build up the leadership talent in the organization. He took a chance on me and hired me into a position that I never would have gotten on my own. He saw something in me that I didn’t see in myself and had the courage to take the risk. Brian gave me my first real shot. He took time to love me and create an opportunity for me. There’s no way I would have been hired into the startup if I didn’t have a warm relationship with Brian and if he didn’t believe in me. I didn’t have the experience or skills, but Brian believed in me, took a chance on me and help put me on the journey that I’m still on today. What are your “5 things I wish I knew when I was just starting out” and why? I wish I knew the importance of being clear on my purpose when I started out on my career journey. I was highly ambitious, driven and passionate but I found out as I went along that purpose trumps passion. I feel that I drifted for a few years in my career because I didn’t take time to define where I wanted to end up and overlay my plan against that to ensure I end up where I want to in my career. I learned that we can either drift to a destination or design our way to our preferred destination. My preference is to intentionally design my way so I can minimize regret and maximize my time given to serve and add value to those around me. I learned I needed to take time to think through my purpose, my loves, my inventory of skills, strengths and experiences and use that to define my near-term plans. This exercise now helps provide guardrails for my decisions and has helped me take risks to do things like start my own companies or act on ideas. This would have helped me minimize waste I incurred early in my career while drifting along. Early in my career, I was often scared to try new things. I was scared of the consequences or ramifications of my decisions and that ended up preventing me from stepping out and trying new things. I did not have a healthy understanding of failure and thought failure would define me instead of developing me. It prevented me from communicating and executing on my ideas, from taking small risks that would have potentially opened doors, from initiating to a relationship with a mentor I could learn from and from being vulnerable with my team. I wish I would have known that failure can be a powerful catalyst if you let it develop you. I wish I would have known that the target is to experiment and fail fast. Experimenting with your ideas allows you to validate or invalidate assumptions as quickly as possible so you can know whether to pivot or preserve. This allows us to fail fast, learn and build towards the future. I used to fear failure but now view failure as an opportunity to learn and develop myself. Failure is still uncomfortable but does not have to be paralyzing. Fear is temporary but regret is forever. I would have never ventured out to start my own companies or took the risk to share ideas within my companies if I hadn’t learned this lesson. I wish I would have known when I was just starting out that relationships are primary and performance is often secondary. I learned the hard way that it’s hard to build a relationship when you need it. Early in my career, I was more task oriented than people oriented. I thought the fastest way to the top or to my desired destination was through my performance and execution of my tasks. That quickly changed early on in my career when I was passed over for a promotion. I was passed over because of the lack of relationship I had with my boss, who was responsible for the promotion decision. It was painful because I thought my performance was exceptional and merited the promotion but I learned this key lesson as a result. Both relationships and performance are key to success but relationships are primary. I call this building relational currency. I learned that I need to constantly be building friendships inside and outside my companies and extending friendship to others. In the end, it’s all about friendship. We learned this in kindergarten but often lose sight of it as we grow up. I wish I knew the value and importance of defining incremental milestones and celebrating incremental wins was when I started my career. I was so focused on advancement that I didn’t allow myself to step back and celebrate the small wins along the way. In doing so, I kept myself from being able to experience the joy and fulfillment that comes from small successes. I was obsessed with completion, and still am, but I’ve learned to stop and celebrate incremental wins or successes. Learning to break down work down into these incremental milestones and celebrating incremental wins also helps me keep going in the face of adversity. The daily work can be challenging and exhausting. Building things is difficult to do and it’s often tempting to just give up. Breaking what I’m building into incremental milestones helps me see progress and, in turn, helps fuel motivation to take whatever I’m working on across the finish line. I learned this from reading the book The Go Giver a few years ago. I wish someone would have handed me this book my first day out of college as I started my career journey It reminded me that the most important investment is the investment in serving others. Early in my career, I thought the fastest way to the top was to push my own brand and agenda. I had a me-first approach vs. an others-first approach. Telling your own story and building your own brand is important, but I learned the fastest way to success, influence and self-fulfillment is found in serving others and helping others reach their desired destinations. Starting my career in the nonprofit world helped solidify this learning. Value was derived from the lives we touched and value created vs. the quarterly or annual financial statements. I wish I would have known and applied this from day one. I believe America is the greatest country in the world. It’s a place where we can build businesses without fear. It’s a place where we can push the limits of innovation and create value that directly impacts the quality of life for everyone around the world. Failure to continue to promote and develop American made products puts all of this and our future at risk. I care because of the mission of the Made in America Movement, the mission to help all of us become more conscious consumers and to enable American companies to create more jobs here in America. This mission has a ripple effect across the rest of commerce in the world and helps strengthen America’s core. The Made in America Movement provides a voice and a platform for the individual to be educated and educate others on the cascading impact of increasing American jobs and increasing the purchase of American made products. There are three books that I either just finished or am currently reading. Reading is a habit I formed years ago and this habit continues to be a catalyst for growth and fueling a growth mindset. 1. The Power of Moments: Why Certain Experiences Have Extraordinary Impact by Chip and Dan Heath – This is a fantastic book that will help you think through how you can intentionally orchestrate memorable moments in business and your life. I read this with my core leadership team and we’re using this framework to rethink how we provide service to our different customers. 2. Barking Up The Wrong Tree: The Surprising Science Behind Why Everything You Know About Success Is (Mostly) Wrong by Eric Barker – This book will really stretch how you think about success individually and corporately. 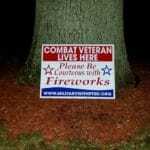 It’s heavily researched based and the research will often surprise you.